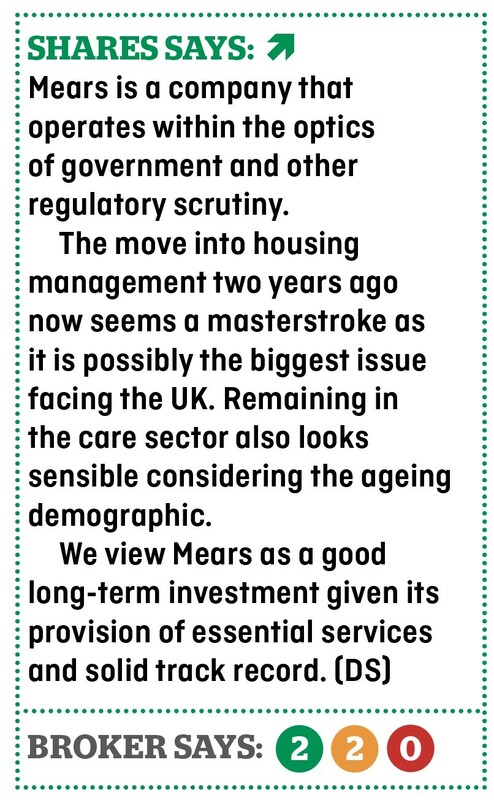 Gloucester-headquartered Mears (MER) operates in some of the most politically sensitive parts of the market: housing and social care. The recent Budget was dominated by measures aimed at addressing the UK’s housing crisis and June’s Grenfell Tower tragedy put the spotlight on the standard and upkeep of social housing. Mears undertakes rapid response and planned maintenance services for local authorities and registered social landlords. To put that into some perspective, it delivers more than 6,000 repairs every day to a portfolio of more than 1m homes nationwide. The company is the market leader in providing maintenance to the sector and is expanding into the larger private rented area. Another part of its business involves the provision of care for older and disabled people who want to avoid nursing homes and would like to continue living in their own homes. Unfortunately local authorities have reduced spending on social care over the last five years, making the immediate outlook challenging, says investment bank Liberum. 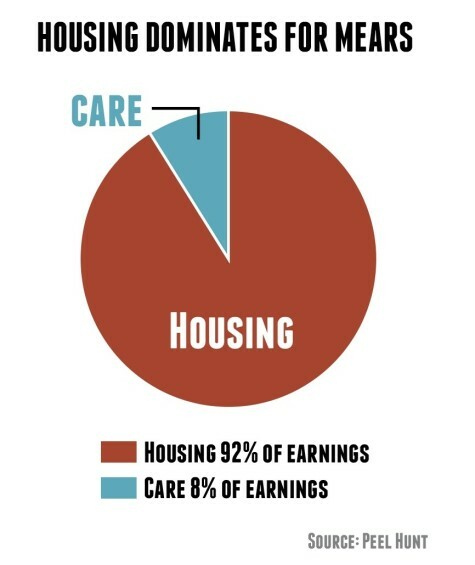 However, it notes that state funded care is increasingly being outsourced to the private sector. It also believes higher pay rates may increase the use of outcome-based contracts and ‘favour quality providers like Mears which already seeks to pay above the market rate’. The care business has been a problem child for Mears but is beginning to improve after a restructuring process. He is quite scathing on the lack of regulation for care workers. He says that cab drivers and bouncers are scrutinised more than care workers who should be legislated. This could potentially reduce the cost of carers as supervision charges may not be so high if the sector was properly regulated. Miles says he had to turn down some contracts as some of the rates offered were around the £13 per hour mark. When national insurance, training and induction are taken into account, ‘you can see it’s not enough’ says the CEO. Such modest rates and reputational risks have seen competition in this space ebb away. Miles says wryly ‘either everyone left too early or they have better foresight than us’. 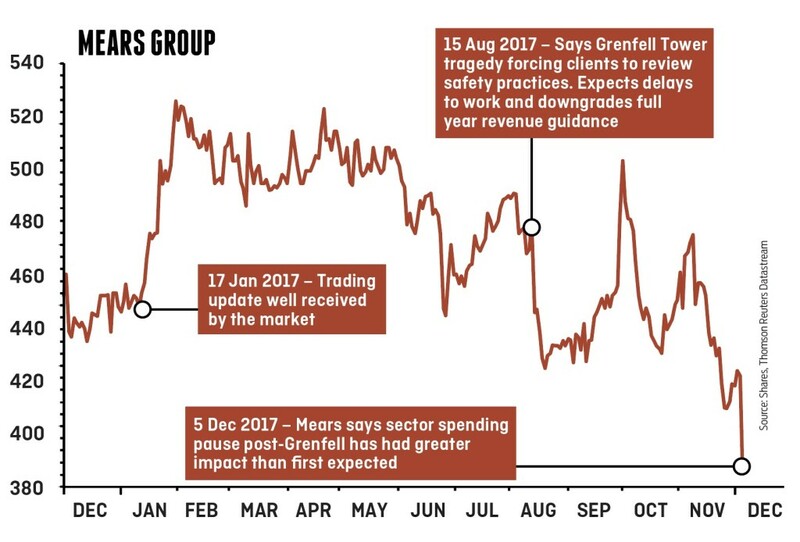 Peel Hunt analyst Andrew Nussey says that Mears’ care division appears to have ‘turned a corner’ but notes it is only a small contributor to group profit. He expects it to represent 8% of 2018’s group earnings. Mears’ housing division stretches across a large number of areas, such as home improvement and installation of solar panels. It has partnerships with more than 70 local authorities and undertakes work such as repairing gas boilers and even cleaning housing estates. The Grenfell tragedy impacted may companies involved in the social housing sector. Some maintenance work was suspended at the time which has had a short-term impact on Mears and is likely to depress 2017 profit. Miles argues this impact should be kept in perspective. ‘I look after 100,000 homes in and around London and a million nationally. Less than 1,000 homes were decanted [vacated due to Grenfell]’. Mears’ move into housing management has been growing at a rapid pace. According to Miles, 18 months ago it contributed £20m to the company’s revenue, now it stands at around £120m. The housing division will represent 86% of 2018’s forecast revenue according to Peel Hunt and 92% of earnings. This is underpinned by management guidance for 5% revenue growth and an improvement in margin performance. What makes Mears stand out? Mears has several qualities which differentiate it from its rivals. For a start, the company is itself a registered social landlord (RSL) and currently has around 10,000 homes under management and more through joint ventures. Given the sensitivities involved in social housing, an RSL such as Mears is an attractive alternative to an unregulated private operator. This benefits Mears as it can lead to longer contracts which arguably are more ‘sticky’ given how embedded its services are with clients. Based on forecasts from Peel Hunt and a share price of 388.5p, the shares trade on a 2018 price-to-earnings ratio of 10.9 times which represents a discount to the wider support services sector on a multiple of 15.5 times, despite decent earnings visibility and growth opportunities. The broker has a price target of 550p.